Part of the crowd that showed up at Kakyeka Stadium in Mbarara on Saturday. 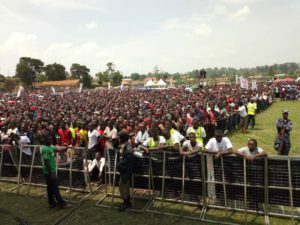 Thousands of Mbarara residents on Saturday turned up at Kakyeka Stadium for the launch of the Bryan White Foundation in Mbarara District. According to the founder Bryan Kirumira, aka Bryan White, the foundation seeks to help youth overcome unemployment through self-help projects. In Kampala, many unemployed youths have already benefitted from the initiatives. The socialite has since November last year been in the over drive, making donations to various social causes. Key among them is paying Shs25 million towards the medical bills for deceased artiste Mowzey Radio.